Mothers – loving, tired, stressed, weary, worried, desperate. The struggles of Haiti etched eternally on their faces. Loving eyes struggle to keep watch, watch the IV, watch the oxygen, watch the temperature. Days and nights of watching and the eyes fight to stay open. Loving arms balancing restless sick children. Road weary feet swollen and hot from days in the hospital. Days sitting on blue chairs. Nights sitting on blue chairs. With occasional respite found on a sheet on the hard tiles. Tiny babies – 500 lbs, 1 kilo, less than 500 lbs. A boy shoved a bead up his nose. A boy shoved a pea in his ear. Fighting for each breath, oxygen, IV, nurses desperately trying to find tiny veins. All veins seem to stay at home. And still the patients come. Young mothers – kids themselves. Young fathers – hurtled into the realities of parenthood. Pneumonia the biggest killer of kids under 5 in Haiti. Tiny premie – went to God. Beautiful Chloe, trying to breathe. Eyes fixed on her praying crying aunt as if to say, “why me? I am just a tiny baby. Why is so hard for me to breathe”. Can she know she has a heart problem and she has not long left. Doctors trying to find space. Meeting after meeting, trying to find ways to find money to keep this hospital open. We can’t afford to keep it open. We can’t afford to close it. Life and death – always dancing together. It should be so easy for life to win. Suffering is there with them. Yes indeed suffering and more suffering. Mothers and nurses and doctors and fathers joined together, united together. An eternal circle, comings and goings. The same fight for life. Every year I get an insight into the realities of life here as Marcus* takes me inside our hospital emergency room. 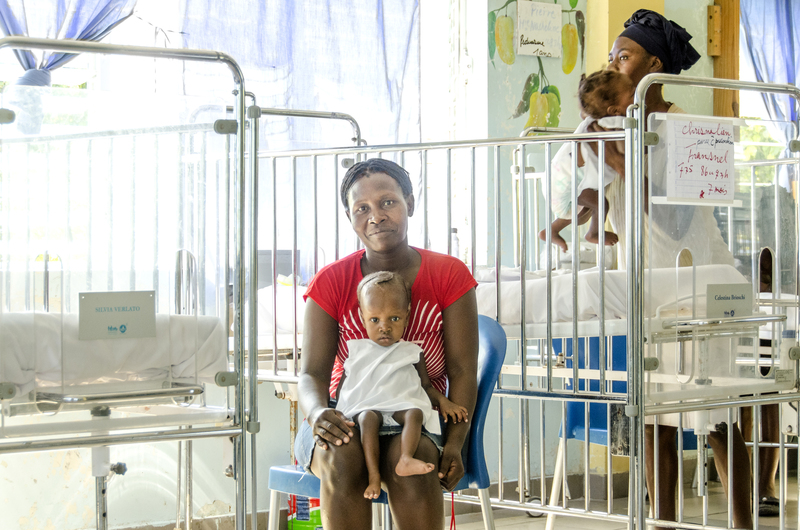 The ONLY pediatric hospital in Haiti. Don’t read this and feel sad. Read this and help us in our fight for life. *Named changed for privacy purposes. Marcus lives at the NPH Haiti home, Kay Christine. He is 15-years-old and is fighting an infection and is currently at our St. Damien Pediatric Hospital. Please keep him in your prayers.